Husband, father, CEO, and Recovery Cartel host, Rich Jones, interviews his wife for some candid discussions around what life is like on the other side of addiction: The family. Tune in for real talk about real recovery. Melissa Jones is a boundary setting ninja and family recovery expert. Her personal experience and unwavering support of the Recovery Cartel has been integral to the mission. Her story embodies an all too common experience for the spouse married to someone in active ... See More addiction. Melissa and Rich have been married for 25 years. They have been able to negotiate the challenges of addiction and the marriage has survived, despite some very difficult moments. 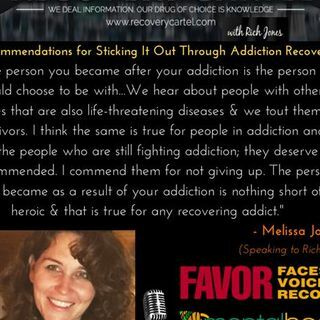 Melissa provides tangible advice and her family recovery experience is a source of hope; especially for spouses as they work through a loved one’s active addiction.